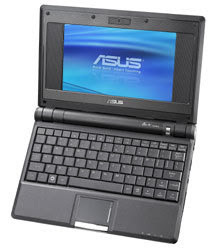 ASUS have managed to create something for which I have been waiting for a very long time - an inexpensive (S$598), usable, small form (225 × 165 × 21mm), notebook computer called the Eee PC. When you consider a Nokia N series or Windows Mobile smart phone is over S$1,200, the value proposition for the Eee PC is compelling. Even more interesting is the market reaction. Sales are way ahead of projections, with the Taipei Times reporting more than 350 thousand units sold, and predictions of 5 million to be shipped in 2008. The user community is already huge, with web sites, forums, wikis, and articles proliferating all over the 'net. That puts the Eee PC in iPod territory. I won't bother to go into all the specs or provide a detailed review as that ground has already been well covered by others. It comes with Wi-Fi, a solid-state disk for storage, 3 USB slots, Ethernet port, integrated web cam and microphone, an external VGA connector, a removable battery, and a decent keyboard and touchpad. The 7 inch LCD screen is fantastic, and the default fonts and type sizes are very comfortable for my old eyes, unlike the more expensive UMPC's like the Toshiba Libretto, Sony Vaio, and OQO. This little device is really going to shake things up in the operating system world. The model I bought came with Xandros Linux wrapped in a particularly simple and easy to use menu system. All the applications you need (to surf the web, send and receive email, use Skype, create and read documents, play games) are already installed. Linux is suddenly on the desktop and actually being used in anger. Although I have installed Linux systems over the years in order to have a look, I am a firm Windows XP user. Linux just seems too fiddly and time consuming compared to Windows. The default installation of Linux on the Eee PC is anything but fiddly. It just works, and that is what good software should do. Using hints and instructions I found by googling support forums, I have already modified the OS to reveal the advanced desktop which ASUS decided to hide, and installed my favourite media player, VLC. It is also possible to install Windows XP on the unit. A DVD disk is provided which contains the Xandros image and the drivers necessary to complete a Windows installation. ASUS is shipping models that have more memory, storage, and XP natively installed, but they have not appeared in Singapore yet. I was so taken with the device that I didn't want to wait for the higher spec units. The ultimate recommendation I can give is that I was so impressed with the Eee PC, I left my usual ThinkPad behind and only took the Eee PC along on a recent 8 day holiday. I was able to access all my email accounts, check the weather forecast, and complete an Internet check-in for the return flight. Who needs a computer anyway?